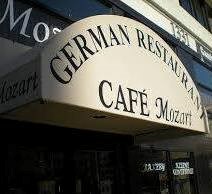 Cafe Mozart is both a romantic and unpretentious downtown restaurant that charms guests with it's "Old World" atmosphere, lilting piano music, downtown views, huge wine selection, great food and service. German Chef Richard turns out German, Austrian, French and Northwest cuisine with a modern flair. Classic entrées include Almond Crusted Alaskan Halibut, Roasted “Broken Arrow Ranch” Axis Venison, Escargots de Bourgogne Sauvages and of course a "Symphony of Schnitzels" In Summer join them for lunch that fortifies those dining for a day of shopping in Leavenworth. Don't forget you can enjoy outdoor dining during the summer as you view our wonderful park and just enjoy life as it goes by.